How to draw Tsunade Hokage from Naruto Manga. Tsunade, 綱手, is the Fifth Hokage who hails from the Senju clan of Konohagakure and is also a descendant of the Uzumaki clan through her grandmother Mito. She succeeded the position after the death of her teacher, Hiruzen Sarutobi. She, along with Orochimaru and Jiraiya, are recognised as “The Legendary Sannin of Konoha”. Learn how to draw Tsunade Hokage from Naruto step by step basic Manga drawing lesson. Learn basic drawing and sketching technique for Manga, Anime and comics from TheArtClasses.com In this tutorial you will learn to draw an Manga character Tsunade Hokage along with basic drawing tips and technique. First, you can use simple geometry shapes to construct the basic Manga head and body. It will make your drawing process a lot easier once you get the shape and proportion right. No matter what you are trying to draw, once you understand its foundation. In this one, you will also learn foreshortening action post from the drawing. Drawing tips, you have to make sure the shape of eyes, nose and mouth are correct. Not only the shapes, but also the placement of eys, nose and mouth. It will make your drawing process a lot easier once you observe the over all shape of the character you are trying to draw. I usually start of using sphere or circle as a base for character’s head shape, then next step would be figuring out the next shape that suit the image. Tsunade Hokage is the granddaughter of the First Hokage, Hashirama Senju and Mito Uzumaki, also the grandniece of the Second Hokage, Tobirama Senju, leading others to call her “Princess”. When she was first introduced, Tsunade was cynical of anyone with dreams, especially those who want to become Hokage. After meeting Naruto, she realises that this cynicism is insulting to the memories of both Dan and Nawaki. After seeing Naruto’s conviction to become Hokage and proving her wrong in his ability to learn the Rasengan, she has a change of heart. Despite her still blunt attitude towards Naruto, she has come to care for him deeply and puts her faith in him for the future, even agreeing to take on the mantle of Hokage herself, carrying on the dreams of Dan and Nawaki. Here is a final drawing of Tsunade Hokage. 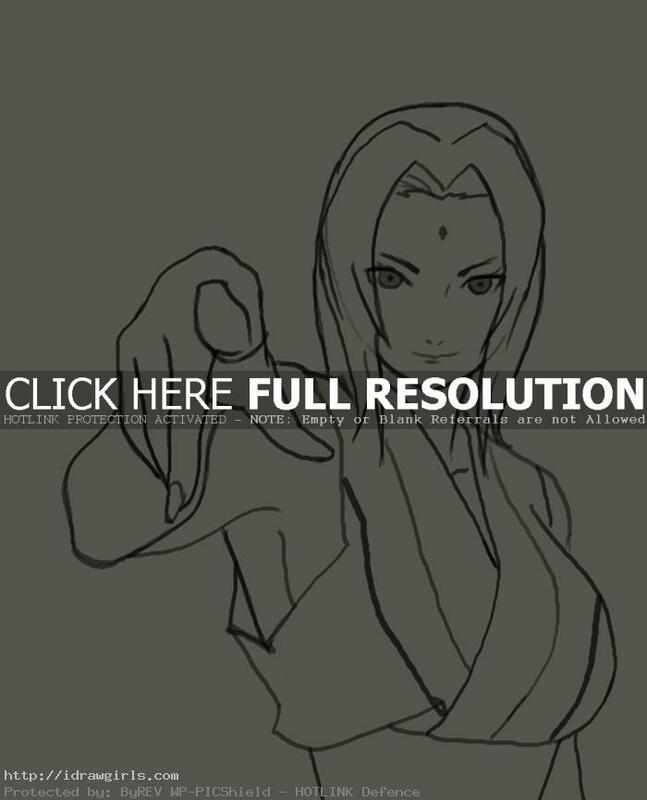 Below are step by step images how to draw Tsunade Hokage. Step one, I just sketched her head roughly. Step two, I drew her face along the established grid lines. Step three, I then added her hair style and part of her torso. Step four, I then sketched out her front hand and arm. It is foreshortening pose. Step five, I started to sketch her fingers along her rough arm and hand sketch lines. Step six, I then cleaned up and finished the rest of the drawing.